Winter is a fine time to prune many trees, shrubs, perennials, and ornamental grasses. Arguably, it's the best time, as you can more easily see the "bones" of the garden and worry less about damaging smaller, neighboring plants. Plus, it gets you out of the house to do something physical. You want to avoid pruning during extremes of weather, of course, but in the Puget Sound area, our winters are often blessed with days of mild temperatures and even our fabled "sun breaks." And the plants don't mind, as long as it's not way below freezing. For the basics, take a look at our previous Pruning 101 post by Kathy Boullin, especially her admonition: "Don't stress it!" That is, don't make a big deal about the timing. You can prune virtually any season, using some common sense. But winter and summer are ideal for any major work. So, what to prune in winter, and how? Really, most plants can be pruned in winter, except for those which will be blooming in late winter or spring (Pruning 101 lists many of these). Those will survive the pruning just fine, but you may lose many of your flowers for this year. Also, it's wise to hold off on roses or tender plants which might still be susceptible to freeze damage. Wait for March or until after most hard freezes are past. Winter is the time for major thinning or redirecting any tree or shrub that needs it. Removing dead, diseased, or broken branches, and simply clearing out clutter (just like inside your house), is a good winter project. And if you need to take out that major branch heading for the picture window, to redirect your tree in a more preferred direction, it's easier to see and cut when it's bare. 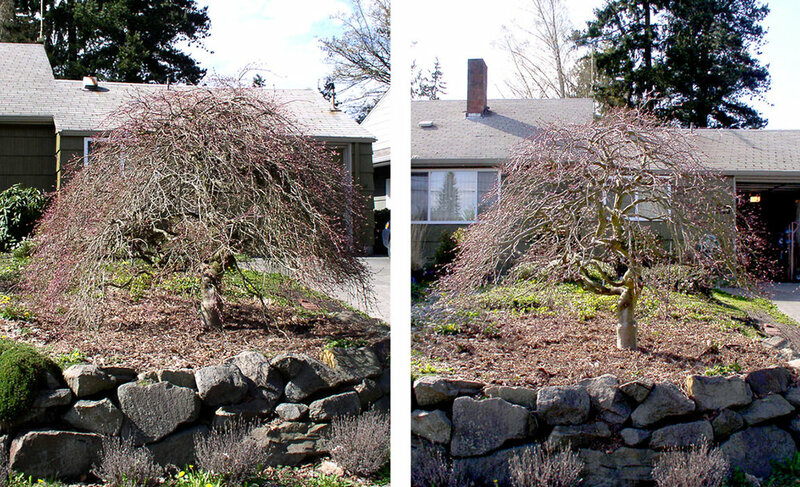 Winter thinning of a weeping Japanese maple, before and after. You can also do basic shaping now, such as heading back wild leaders and shoots (See Spring Pruning: What Should I Do? for more detailed information about heading back). Arching shrubs such abelia, blueberries, and summer-blooming spiraea can be headed back if they've become overgrown. Again, light heading back of some spring bloomers, such as mock orange and forsythia is okay, as long as you don't eliminate all their bloom buds. Most varieties of hydrangea can use some removal of dead wood but try to leave most of last year's new growth, which is what will bloom later this year. You can get more aggressive with plants such as red twig dogwood, smoke bush or shrub willow. If they've grown too large or dense, they can be cut down – even to the ground – in late winter. This will encourage vigorous new growth (which is often the most attractive) this year. Typically, you don't need to do this every year. If the clear-cut look is not for you, remove about 1/3 to 1/2 of the canes, rather than every single cane. The same goes for hard pruning to reduce the size of a huge laurel hedge or similar behemoth. One "common sense" note: it doesn't hurt such plants to do the hard pruning another time, but doing it in late winter, just before spring growth begins, minimizes the time you have to see their "ugly" phase. Most trees, by the way, do not respond kindly to this style of hard pruning. It can create ugly and unhealthy trees. There are exceptions, such as "pollarding" or "coppicing" (essentially forms of hedging) but these are specialized situations. We strongly prefer regular thinning to enhance the trees' natural form. You may learn more on our previous post, Spring Pruning Part 2: Thinning. Another group to prune aggressively in winter is fruit trees and berries. We prune them for maximum fruit production. Most do best when we open up their form for light and air circulation, and remove energy-hogging suckers. Well-pruned apple trees, opened up to allow light and air circulation. Photo: Curran Apple Orchard. For cane fruits like raspberries, prune out older canes (which fruited last year) and keep one-year-old canes to grow and fruit. The same principles that apply to trees and shrubs also apply to vines. Thin out the clutter. Snip back the wild leaders (not intended as a political statement). Hold off or go minimal on spring-blooming vines until after they bloom. 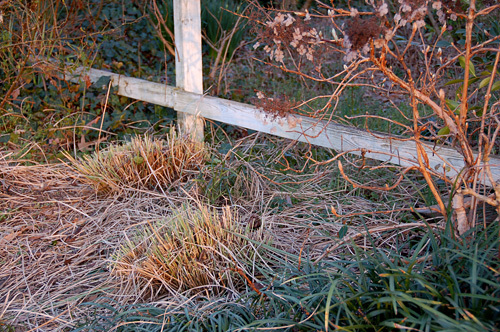 Ornamental grasses or upright perennials which have collapsed or are overgrown can be cut back, if you haven't already done so earlier in the season. Most varieties are rather obvious when they need the winter haircut. Some should be cut a few inches above the ground, where others can be cut back to ground level. Try to avoid cutting any new green shoots which may be emerging from the base. Winter grasses that have been cut back. Photo: Phillip Oliver. Many evergreen grasses don't need to be cut back very often, just lightly thinned and cleaned out. If you're not sure which treatment is best, please ask us in person or on social media with #heyswansons! Pruning is more physical than you may think! If, like most of us, you have been less active during the winter (and after all the holiday sweets), make sure to warm up, stretch, pace yourself, and take other precautions to prevent strain or injury. Of course, you might have more questions on pruning specific plants (and we encourage you to ask us! ), but we hope this encourages you to get out there and take advantage of the slower season to give your garden an early start on its best year ever! Editor’s Note: A version of this post was originally published January 2017.